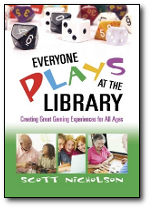 'Everyone Plays at the Library' by Scott Nicholson from Information Today, Inc. If you are interested in the why, what, and how of library gaming, Everyone Plays at the Library is the place to start. Scott Nicholson—educator, librarian, game designer, host of the "Board Games with Scott" video series, and founder of the Library Game Lab of Syracuse—shows how gaming programs can be successfully implemented in school, academic, and public libraries, covering all types of games for all age groups. You'll learn how to determine user needs, achieve library goals, gain stakeholder approval, reach out to users, build an affordable collection of great games, assess program effectiveness, bring all ages together, and create the type of memorable experience that gets users talking and keeps them coming back for more.